Hi. 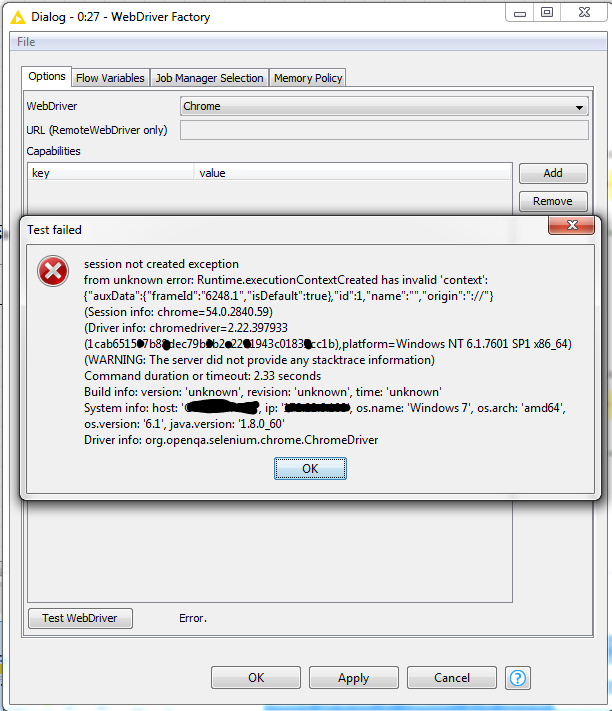 For some reason running WebDriver with Chrome isn't working, the browser just opens and closes immediately with an error. I tried reinstalling Chrome and it did not help. Any suggestions? Last week it was working fine. Firefox has never worked for me. this is caused by some protocol changes in a recent Chrome update. We'll release a fix during the next days. Thanks Philipp. In the list of drivers I see Linux 32/64, Mac 64, and Win 32 but no win 64. Are you able to download the Win32 file? It says it is corrupted when I download it. Could there be a similar reason why the firefox driver doesn't work either for me? I tried downloading ChromeDriver 2.23 and can't set it in the preferences. Can you explain how to do this so I can do it if/when the 2.24 file is fixed? Thank you. 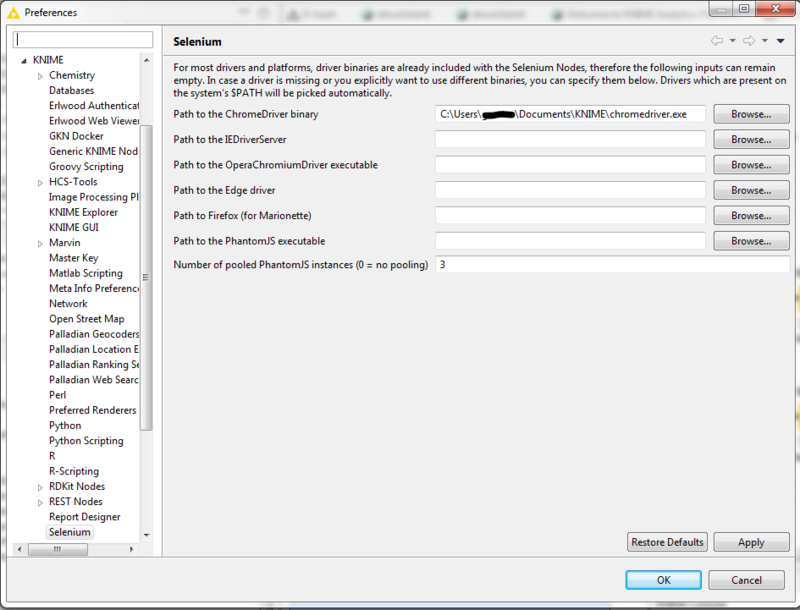 EDIT: To overwrite the driver: Go to preferences -> KNIME -> Selenium. I have firefox version 49 installed (see firefox fail picture). I changed the firefox settings to never ask for updates and it did not solve the problem. Firefox opens, stays open for a minute and then closes. A minute later knime node throws the fail. Concerning Chrome - I uninstalled chrome 54, installed chrome 53 and now selenium works. Not sure why I can't download the Win32 file in particular but can any other file on that site. I've just downloaded the binary on a Win32 machine and it can be opened without issue. Maybe it was just your download which got corrupted. Your screenshot looks correct, so this should work, once you have a working 2.24 driver binary. Concerning Firefox: Is your browser up-to-date? You may see this error occasionally, when Firefox is trying to update itself during start, which takes some time, and Selenium encounters a timeout . Update: The recent update now includes ChromeDriver 2.24. 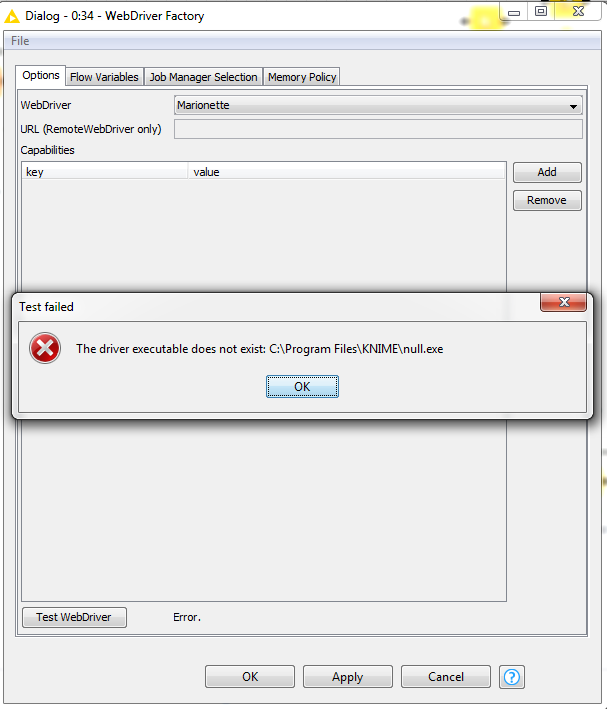 Execute failed: Marionette binary could not be found in bundle; this should not happen. Whoups, this should indeed not happen, sorry :) You're running on Windows, right? Yes, this is Windows issue. Fix is on the way and available on the update site in ~ 1 hr. sorry, previous attempt was a bit too quick, the issue was still present on Windows. I just released a new update a few minutes ago which finally fixes this problem on Windows. Thank you for getting back, and let me know if you should still encounter any problems.